Patrik Lindström Darkwave, Futurepop Italy is first of all famous for its pasta, the photo model Fabio and even football, but the label Decadance Records are trying to add "releases of good electro dance records" to that list. This time the label places their bets on the Greek one man project Blue Birds Refuse To Fly. The man behind this project is Kyriakos Poursanides and is a former keyboard player in the Greek indie band Wasteland. 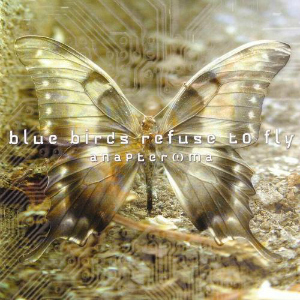 As Blue Birds Refuse To Fly, Kyriakos have earlier released a record back in 1998 with the given name 'Give me the wings' and at that time he had some help from Cristina Mihalitsi and George Priniotakis with the writing and the vocals. This time he has taken help from George Dedes who's the singer in the band Illusion Fades for ten years. This project have taken a turn against the more dance oriented music, but still varies with some more goth inspired electro and even some instrumental dance music. Quickly the more fast tracks "Lacrima Di Balena II", "After Dark" and "Quasi Stellar II - Give Me The Wings" becomes my favourites, truly amazing dance music which hopefully will manage to locate our Swedish dance floors. When the slower and more gothic electro begins it's time for George Dedes to step forward. His voice varies between happy and high pitched and the second later go to the complete opposite with a dark, muttering voice which would had impressed most of the goths even in the most pretentious goth joint. The favourites in this very context are "Some Roads Can Take You Everywhere", "Play With Me" and "As I Fall". A very varied production, but in its whole part a very pleasant surprise with an interesting concept. Italy is first of all famous for its pasta, the photo model Fabio and even football, but the label Decadance Records are trying to add "releases of good electro dance records" to that list. This time the label places their bets on the Greek one man project Blue Birds Refuse To Fly.